← Parma Number 24: The Norman Hotel … This is definitely a steak restaurant!!! The Verdict: The Monier chicken Parma was a very good Parma let down a little by its side dishes. Chips that both had been too long in the hot box and too long under the chicken breast are the reason this was not Brisbane’s Best Parma. Chicken: The chicken piece for this Parma was one of the best I have had on my search for Brisbane’s Best Parma. It was perfectly crumbed, well cooked and tasted great. Tomato Sauce: The hero of the meal was definitely the tomato sauce. It was a Napoli sauce full of flavour tha complemented all of the aspects of the chicken portion well. Quantity wise it was spot on for the size of the chicken piece. Ham: The Monier Hotel Parma also got the ham 100% correct. It covered the chicken piece and complemented all of the other aspects of the chicken portion perfectly. Cheese: The cheese presented another triumph for the Monier Hotel Parma as it was perfectly melted and from a quantity perspective was absolutely on the money. Side Dishes: I had really high hopes for the chips with this dish but after I lifted the chicken portion off them those hopes evaporated. The sad part is that I am sure on most other dishes I would be raving about the chips but given that on this dish they had all been wedged under the chicken they came away a bit soggy in places. Those chips that weren’t soggy looked and tasted like they had been heated for a bit too long. The chips were also devoid of salt. The salad was actually pretty good. It was fresh and well dressed. Presentation: Yet again the picture above speaks for itself. Despite there being ample space on the plate the meal was all wedged together which just does not work for me. The Venue: The Monier Hotel is situated on Monier Road in Darra in the Brisbane western suburbs. It has been completely rebuilt after a fire a couple of years ago. The bistro is very large with indoor and outdoor facilities. The menu is just as large. My Parma was $22 which was spot on! The Final Word: It is sad that the chips let this meal down because it definitely had the makings of a potential front runner in this quest. Over heated but soggy chips though killed the Monier’s claims for the coveted “Robert Parma” award. Still this Parma will sit in the top 5 at the half way point! 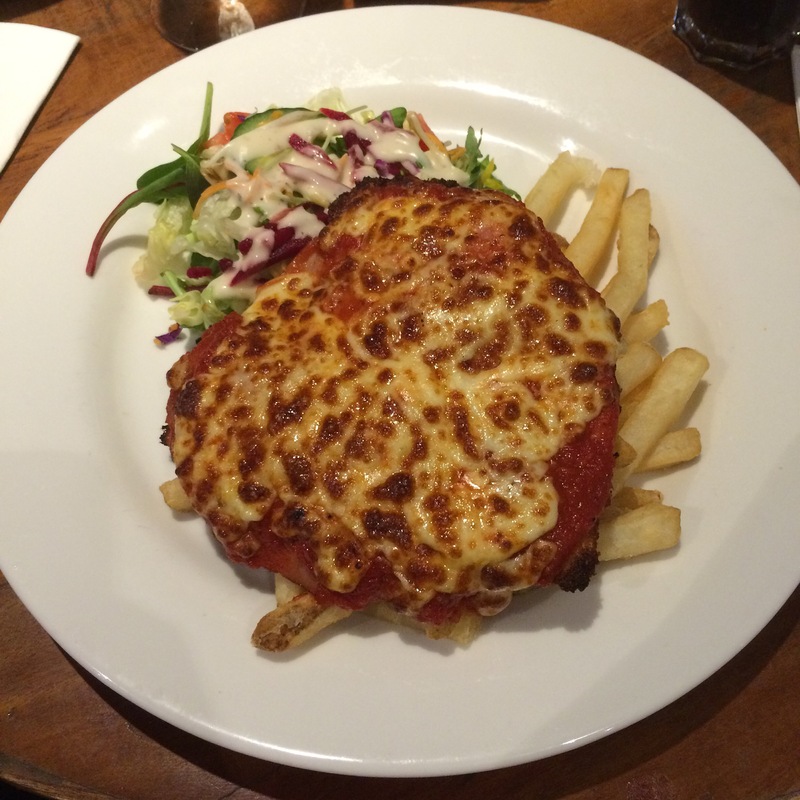 This entry was posted in Uncategorized and tagged Brisbane, chicken, chicken parmigiana, food, Monier Hotel. Bookmark the permalink. 3 Responses to Parma Number 25: The Monier Hotel … Only 25 more Parmas to go!!! What is it about this trend of putting the chips under each meal? Doesn’t matter what it is, they will go soggy. Love a good bucket of chips and gravy myself, but still want the chips relatively crispy. I agree with you Parma-man! Thanks mate: I just don’t get it! When there is an acre of room on the plate why not spread the food out! Can we get a UN resolution on this or something? Peace in the middle east isn’t possible so let’s get something worthwhile done.